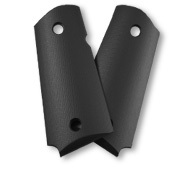 Our subcompact smooth grips are manufactured with the same precision as all of our products. The subcompact smooth grips are slightly different from our other smooth grips in that they are designed with a slight ribbing to the finish. This finish gives a slightly better purchase than the completely smooth surface grips. All Subcompact Gips are made to order, there is a 1 to 3 week lead-time for shipping. 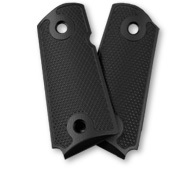 Our new Subcompact checkered grips are manufactured with the same precision as all of our products. These checkered grips are designed for maximum purchase by using our complete coverage checkering pattern. The checkering depth is as aggressive as possible without loosing any structural integrity in the grip. This finish gives the best purchase available on a these grips. 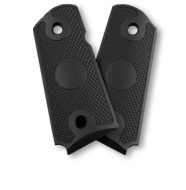 Our Checkered Subcompact grips are designed to fit the Detonics Combat Master and the STI Rogue. All Subcompact grips are available in standard thickness or slimline with or without the ambi option on either style style. The Subcompact Deluxe Tactical Checkered Grip is designed for a smooth unobstructed purchase of your 1911. The checkering on the front half is designed to assist in the stability of shootinng while offering an excellent grip on the withdraw from the holster. The result is a grip anyone would be proud to wear on their 1911. Please note that replacing the bushings and screws is not necessary except when changing from standard thickness grips to the slimline style. 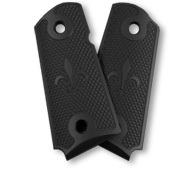 The Subcompact Deluxe Fleur-de-lis Checkered Grip takes all the utility and durability found in the Checkered Grip and adds a touch of class with its unique design. The result is a grip anyone would be proud to wear on their 1911. Please note that replacing the bushings and screws is not necessary unless changing from standard thickness grips to the slimline grips. This is the style of Subcompact grip to choose for laser engraving your custom image, logo or initials on the grips. These grips offer the same stability as all of our standard checkered grips. Please note that replacing the bushings and screws is only necessary when changing from standard thickness to the slimline grips. 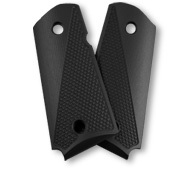 All Subcompact Grips are made to order, there is a 1 to 3 week lead-time for shipping.